My foray around the northeast of England highlighted several things to me. Firstly, the northeast has a very active, lively and healthy beer scene. Secondly, there are some superb microbreweries operating in this region. Thirdly, this region has some of the best pubs I’ve ever been in. Fourthly, Golden Beers are mostly desperately boring. This fourth point is not so much a result of location as of timing. I was touring the area in late summer/early autumn, and all the ‘summery’ beers were still to the fore. This period seems to last longer each year, as people desperately try to hang on to summer – like those people who whinge and moan every year when the clocks go back to ‘winter’ time. It’s not winter time at all, it’s our natural time. 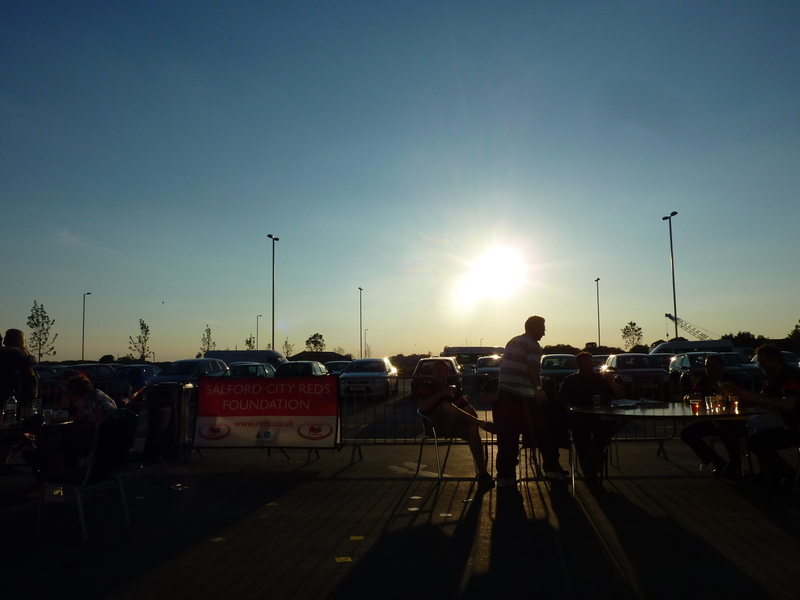 Summer time does not make the evenings longer – you just get up an hour earlier. Likewise, golden beers do not make a summer – as has been amply demonstrated this year. I’ve long been suspicious that breweries are making use of this relatively new style in order to brew cheap and uninteresting beers. My thoughts on this crystallised during my sojourn in the northeast, when faced with yet another barful of the insipid things. I am instinctively wary of any beer labelled ‘So-and-so Gold’ or ‘Golden Something’. The inclusion of the reference to that precious metal is often a clear indication of yet another boring beer. I mean even the names lack imagination. I didn’t start off my relationship with golden ales with such negativity. It was a long time ago, but I think my first golden ale was Hop Back Summer Lightning. I was, and remain, very impressed with that. Other goldens have also wowed me, such as Slightly Foxed Bengal Fox, Oakham White Dwarf, Oxfordshire Pride of Oxford (strangely, not so good in bottles) and Red Lion Chardonnayle, to name but four at random. Like any style, I suppose, there is a wide range in the taste and quality of golden ales, and I am expressly not aiming my comments at those brewers who heap as much care and passion into their golden ales as they do into all their other beers. Is the golden ale a fad? I think maybe there’s a touch of that about it, but it’s here to stay. Originally, the golden ale was perhaps invented (some time in the mid 1980s by most people’s reckoning; Exmoor brewery claim that their Exmoor Gold – a fine brew by any standards – was the first) to tempt the lager drinker away from their nasty mass-produced tasteless product and to present them with something that looked more like what they were used to drinking. You won’t get a lager drinker to try his first pint of real ale if it’s a heavy porter or a strong stout, the shock of the difference will be too great. But present a real ale that looks lagerish, then you’ve won the first battle. Does it then follow that the second battle should be about taste? Yes it does. A fine, crisp, hoppy mouthful is what you should expect, but some brewers seem to have taken the line that if making their golden ale look like lager wins the first battle, then making it taste the same by the simple expedient of removing almost every last vestige of flavour, should win the second. The trouble is that nobody is going to go for that. The adventurous lager drinker may try a dull golden, be unimpressed by the absence of taste (he was told to expect so much more), and return to his usual ‘product’. The real ale drinker will be equally unimpressed (he’s used to so much more). I am sure that I am not alone in disliking having to strain to get any taste from beer. Comments like ‘a bit hoppy, but only a bit’, ‘flavours all rather muted’, ‘slight hoppiness at the end, but not much’ and ‘slight hops fail to get a grip, not much flavour’ pepper my notes from my northeast tour. This blog carries on from where I left off here. 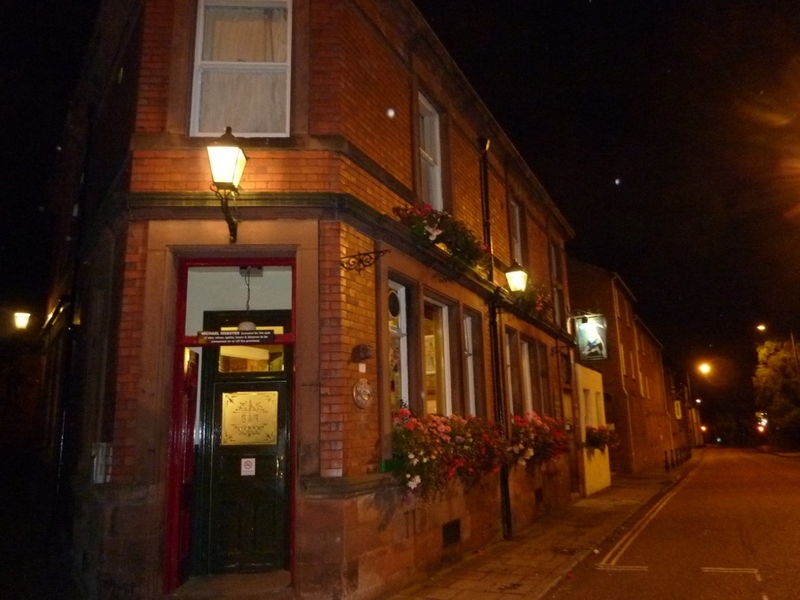 Last time, I left my epic pub crawl round Sheffield at the famous Kelham Island Tavern. We now stretched our legs a little bit to get to the Shakespeare on Gibraltar Street. This pub has the sort of story behind it that just warms the heart. It was a noted live music venue, owned by Punch Taverns, who closed it early in 2010. 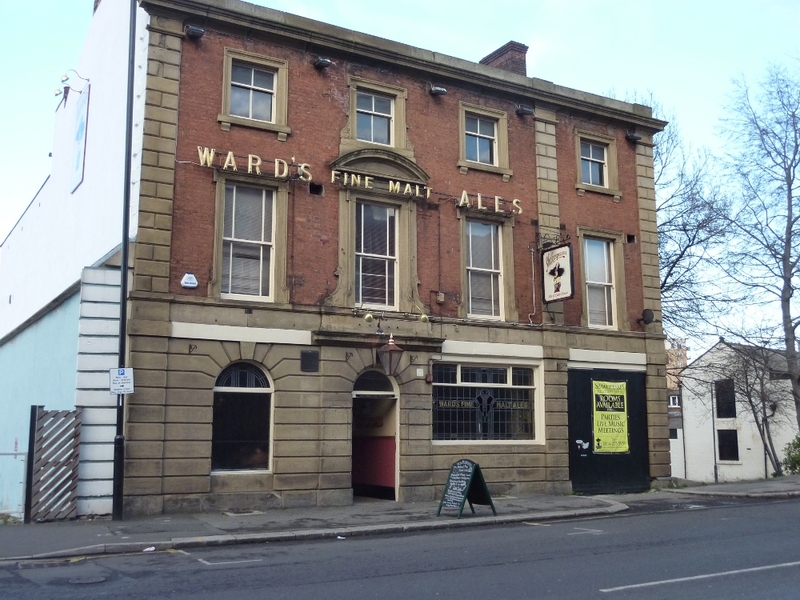 After a period of 18 months, the pub was re-opened in July 2011 again as a live music venue and more importantly (for me, at least) as a true real ale pub. The man you should thank for this is William Wagstaff, the Shakespeare’s landlord. To be honest, the Shakespeare is in a bit of a run-down area, and has a frontage that imposes rather than invites. Nevertheless, it is an impressive building (an 1820s coaching inn). 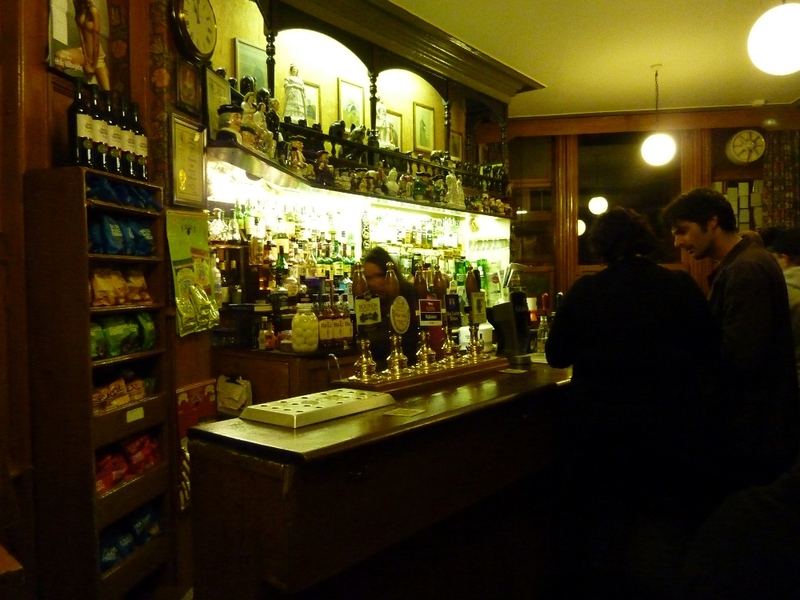 Inside, it’s all wooden floors, wood panelling and a real feel of how pubs used to be. The rooms have been nicely refurbished and are full of interesting items. The seating consists of benches and stools. 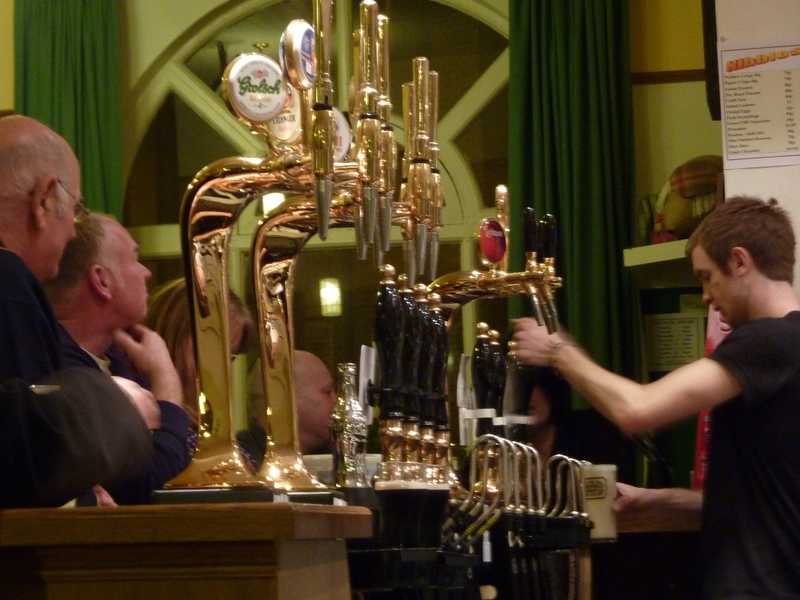 The bar is very impressive, with nine handpumps in use at the time of our visit. We liked the Shakespeare, and so stayed for three rounds. I started with Craddock’s Saxon Gold. Craddock’s is a new brewer to me, they’ve only been brewing for about a year and are based in Stourbridge in the Midlands. If Saxon Gold is anything to go by, then I predict that they’ll be making big waves pretty soon. Saxon Gold is 4% golden ale, light and highly refreshing. The finish is excellent, hoppy and yet somehow almost sweet. Lovely stuff. Next up was a brew from the local Steel City brewery, a 5.7% dark ale called A Slight Chance of Overhopping. I’ve had a number of these hoppy dark ales now, and I’m growing to like them very much. This one is dark in flavour with strong roasted maltiness coming out in the initial taste which then morphs into a good strong hoppy finish. It’s jolly good, but not, I think, overhopped. The final offering from the Shakespeare was Rudgate Fuggle Trouble, a 3.6% bitter. This is where it all went a bit flat. Just not enough flavour. A bit of malt, a bit of hop. Big deal. Onwards then. 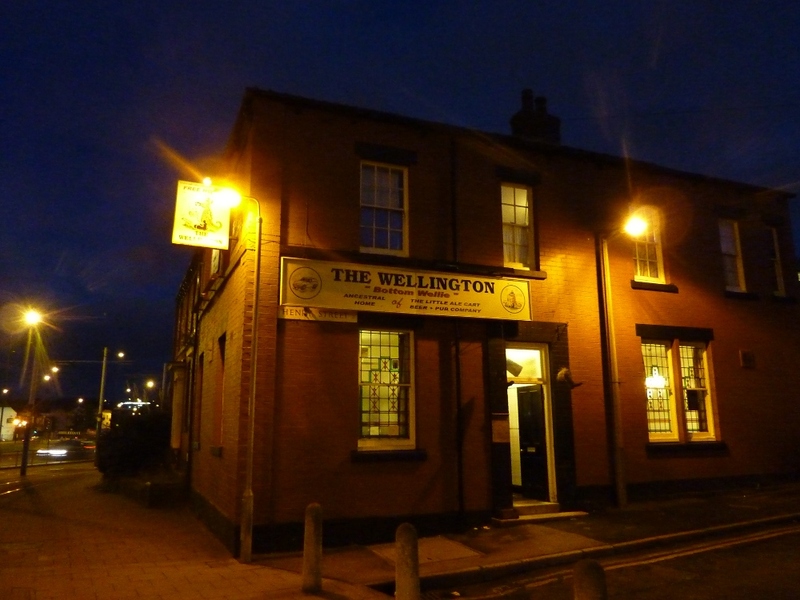 The next pub was the Wellington, a traditional Victorian end-terrace street-corner boozer, and what a little gem. It has its own in-house brewery, Little Ale Cart, and the bar positively bristles with ten handpumps. The landlord clearly supports small breweries, and I got to sample beer from more new-to-me brewers. First was Newman’s Creative Cat. 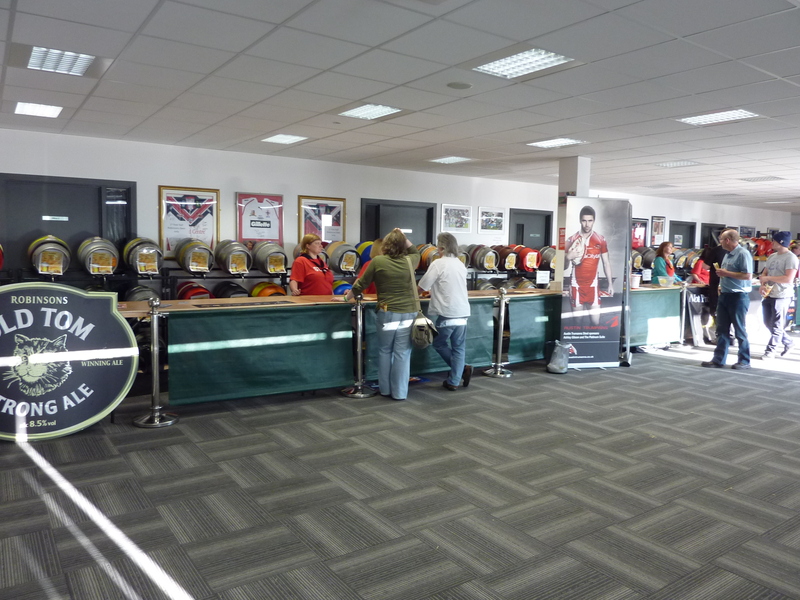 Newman’s is a joint enterprise with Celt Experience brewery of Caerphilly. Creative Cat is a mid-yellow coloured 4.3% bitter. It’s nicely hopped with a touch of graininess to the mouthfeel. Essex brewer Mighty Oak provided the next jar, Enter the Dragon, a 4.5% porter. It packs a mouthful of roasted malt with a very pleasing smooth sweetness. I wanted another, but more curiosities awaited me on the bar. The on-site brewery Little Ale Cart was represented by two beers on the bar. The first one I had was Gay Crusader (yes, really! ), a 5% strong bitter. This is a smooth, full-bodied beer with a slight spirituous overtaste. Very nice – my list of beers to session on at a later date was growing steadily. Little Ale Cart Lumley Castle was next, a 4.3% bitter. Quite a contrast to the previous bitter, this one was very mild flavoured. That is not to say it lacked flavour, because it didn’t. The hopping at the end was light and gentle. 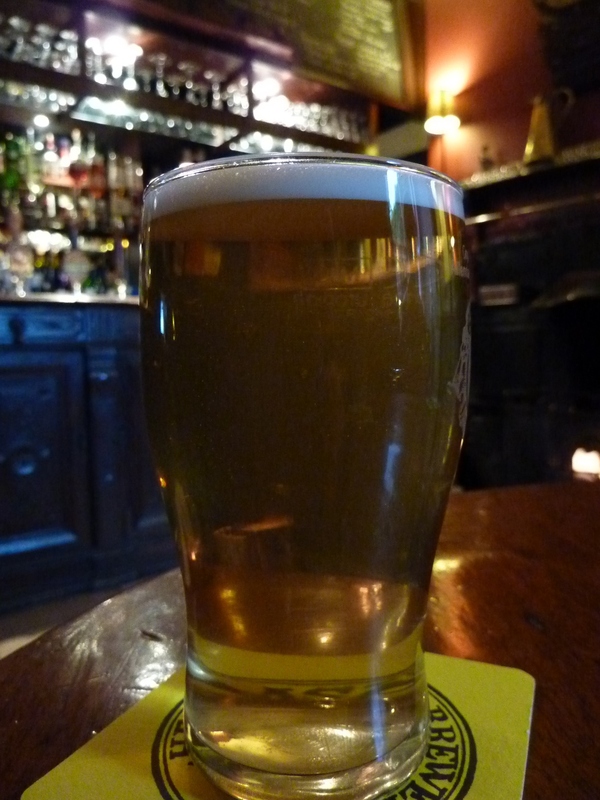 For my last beer at the Wellington, I tried Millstone Vale Mill, another bitter, slightly lighter this time at 3.9% – session ale strength. Vale Mill is light, fruity and refreshing. The taste turns gently to hops providing a light, creamy finish. Three bitters, all quite different from each other. Our next port of call (some distance away) was the superb Gardner’s Rest, on the wonderfully named Neepsend Lane. The main bar area is light and airy and there are comfortable seating areas to the rear of the pub. 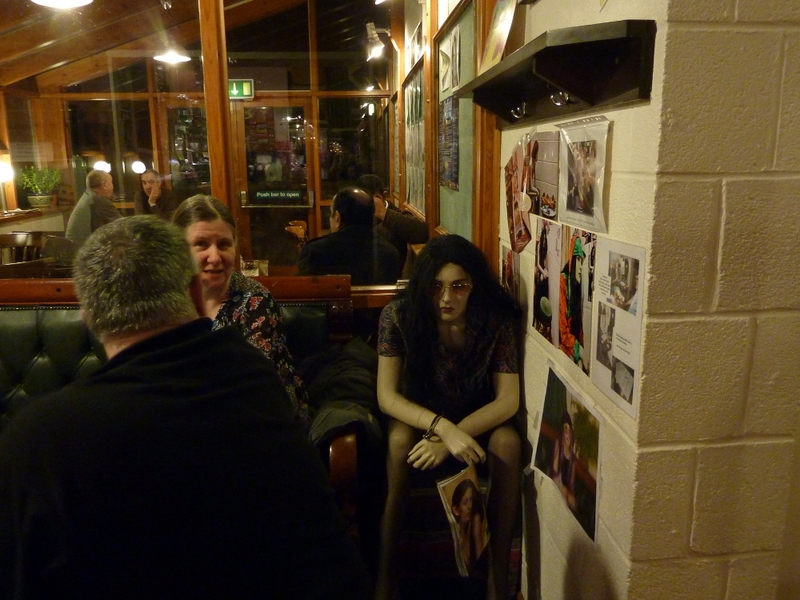 A mannikin sits, looking rather bored, at one of the tables. The bar is well stocked, with eight handpumps and three fizz dispensers. 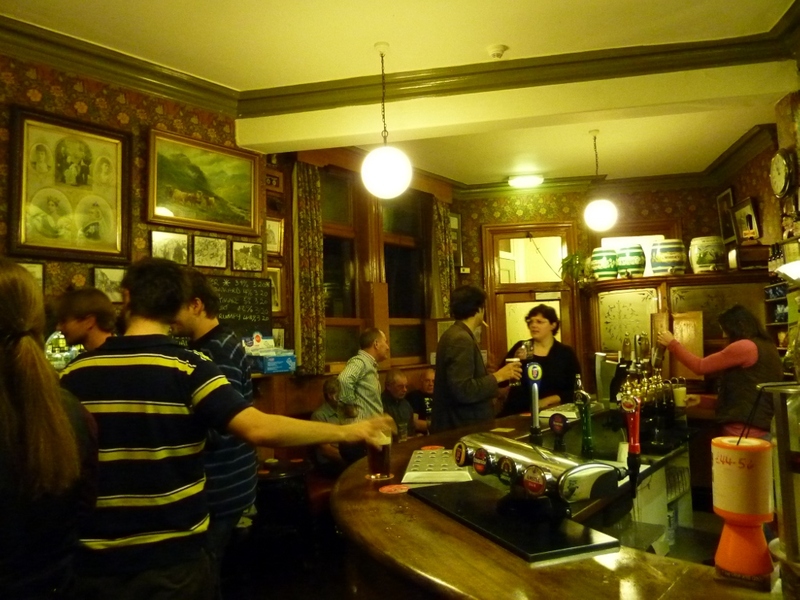 The Gardner’s Rest is the brewery tap for the Sheffield Brewery, and four of its beers – Porter, Five Rivers, Crucible Best and Seven Hills were on offer. Being something of a contrarian, and because I was a bit cold after the hike through the chilly streets of Sheffield, I opted for a Bingham’s Hot Dog, a 5% chilli stout. Just what the doctor ordered. It is rich and malty with a strong chilli flavour to put a bit of fire into the coldest of bellies. Great stuff. Hunger gripped us at this stage, and we repaired to the Hillsborough Hotel on Langsett Road for food. After a very satisfying meal, we caught a tram for the seven thousand mile trip back to our hotel. Coming next… the final three pubs! Words and images are my copyright. Please respect that. All you have to do is ask. Thank you. The watchword at Stringer’s Brewery in Ulverston in Lancashire is “renewable”. The microbrewery (which they helpfully define as “like a big brewery but much smaller” on their bottle labels) is powered entirely by renewable energy. They’ve been around for about four years now, and are starting to have a real impact. All their beers are based on Maris Otter malt, whole flower hops and Lakeland water. 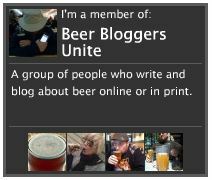 Personally, I have had eight of their beers from the cask and three from bottles. I’m going to concentrate on these last three. None of these is bottle conditioned. 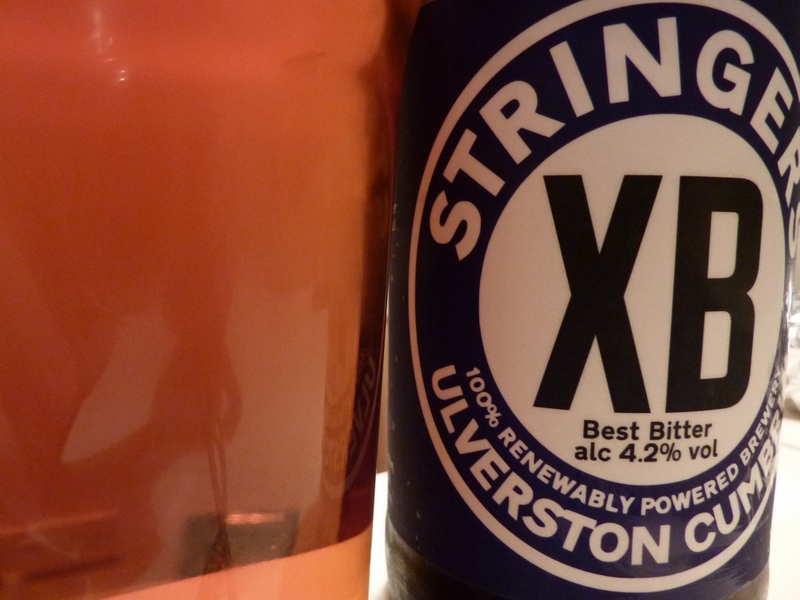 I’ll start with Stringer’s XB (4.2%), which as you would expect from its name is a best bitter. 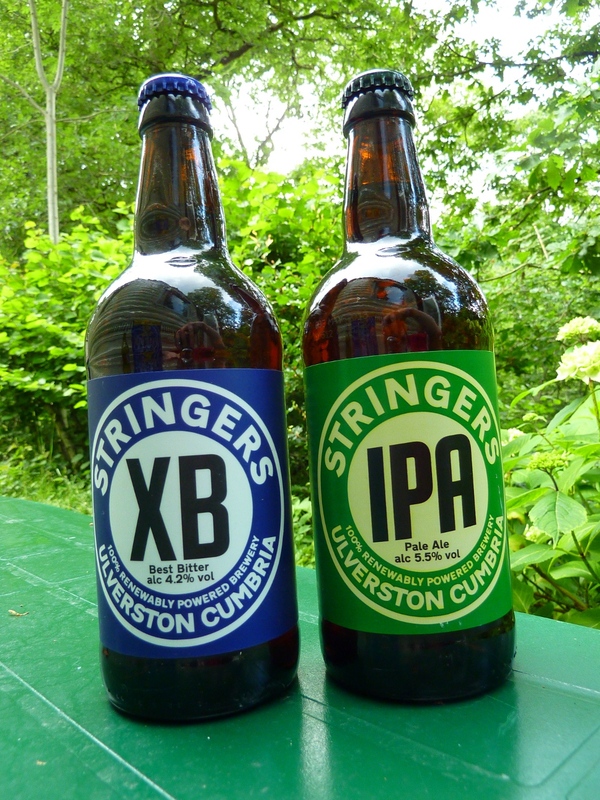 In fact, although the bottle is labelled XB, this is called Stringer’s Best Bitter when it comes from the cask. It’s a mid-orange in colour and the bottle produces a thin head. The smell combines a warm maltiness with nice flowery hops. The overriding taste is of the bittering hops – there is a real abundance of hop flavour which grows and grows through the taste. At the finish it almost tastes like quinine. The malt is detectable as a small undertaste. The cask version produces a more flowery dry finish, but either way, this is a beautiful beer. Next, Stringer’s Dry Stout (no picture of this one, sorry). This has a respectable ABV of 4.5% and pours black. It is dark and deeply malty with delghtful hints of toffee, coffee and chocolate. The dryness becomes most apparent in the finish. Lovely. Finally, we move on to the strongest of the three. 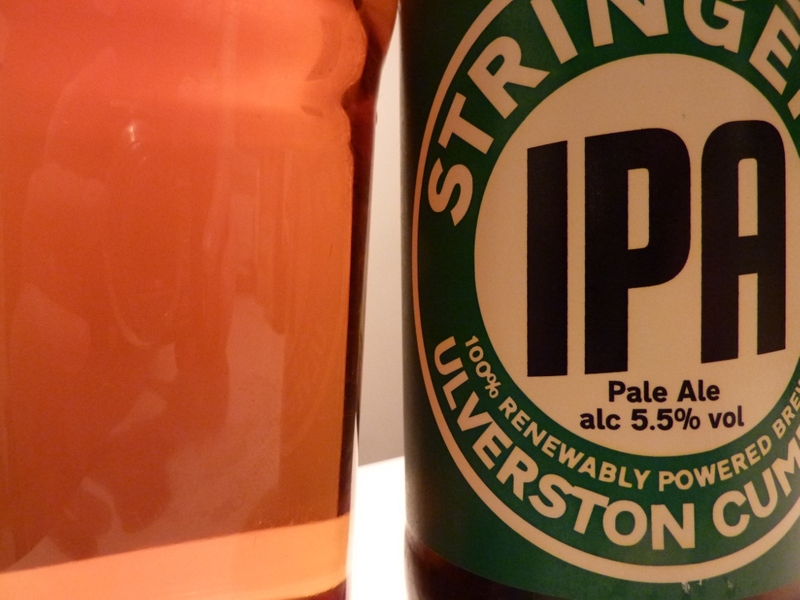 Stringer’s IPA has an ABV of 5.5%, and packs a huge wallop of taste. It starts spicy and peppery, growing through a real orange marmalade middle and finishing with very strong floral hops at the end. A whole array of fantastic flavours in one mouthful. I love a complex beer, and I love this. 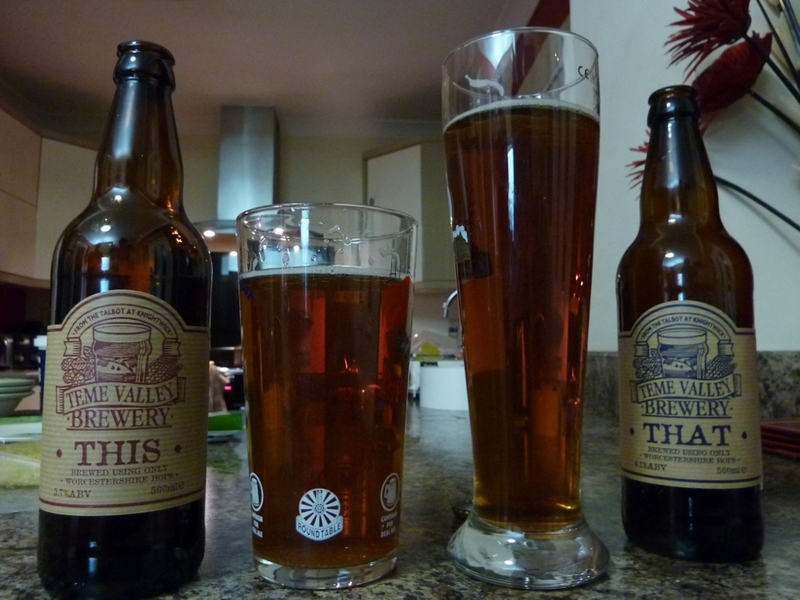 Two bottled beers to be reviewed today, both from the Teme Valley brewery. The labels are nicely uniform and quite attractive, in an understated way. The beers are called This and That, and were drunk side by side. Both beers are bottle conditioned. ‘This’ is a 3.7% brew, the label does not inform as to what type of beer it is, but I would class it as a bitter. It’s orange in colour. There’s a certain maltiness to the smell. The flavour is dominated by an initial malt taste which is followed (just) by a slight hoppy bitterness. I’m afraid that’s about all I can say. There’s nothing really to hang a review on to here. It’s one of those beers that just tastes like beer. And so on to its sister brew, ‘That’. ‘That’ is a 4.1%… well, I’m going to say ‘bitter’ again. It presents an orange colour that may be a shade darker than This, but only just. ‘That’ is slightly smoother than ‘This’. There is a certain bitterness that fades away very quickly, leaving virtually no aftertaste. I’m sorry, you can probably tell that I’m struggling to say anything about these two beers. The fact is that there really is very little to say. This and That are two beers which fall into the ‘OK, but not special’ category. What’s more, they are so similar to each other that they barely deserve separate names. What is the point? These two beers have very similar ABVs, are almost identical in colour and barely distinguishable in taste and it has to be said, both equally dull. Sorry, Teme Valley, but if you want to set the beer world rocking, you’re going to have to do better than This. Or That. ‘What was that?’ You ask. ‘A porter from Tetley?’ Well, for my money, now that Tetley has been completely bought out by Carlsberg and the historic brewery in Leeds now sits abandoned and decaying, Tetley no longer exists, despite the continued use of the logo by Carlsberg UK. Anyhow, Carlsberg has produced this limited edition beer with the intention of giving 10p for every bottle sold to the Help for Heroes charity, which does great work for soldiers wounded in current conflicts. The label on the bottle informs us that Carlsberg hopes to raise £100,000 from sales of this beer, which is available on tap and in bottles. This is all very well and good, and most certainly a worthy cause. 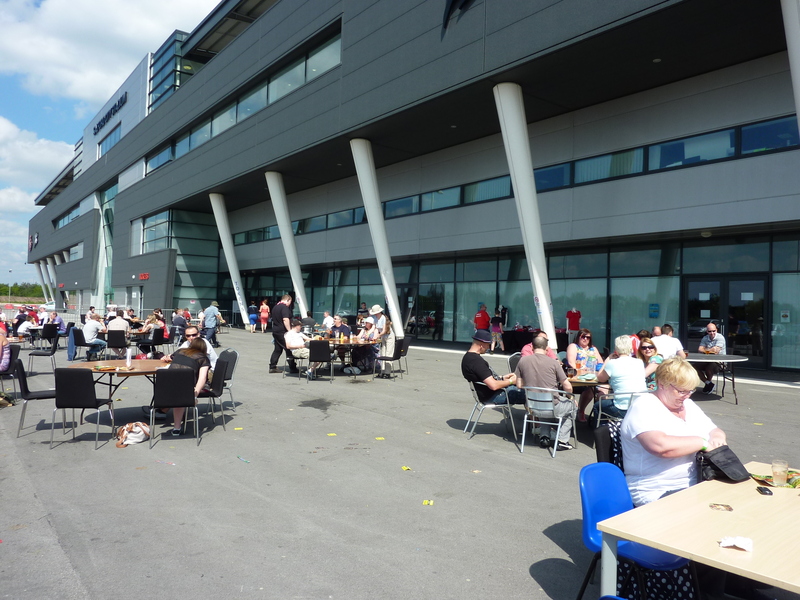 You may think that Carlsberg has ample funds simply to give the charity the money without the necessity of boosting their own profits at the same time. You may wonder about the moral rectitude of buying anything produced by this Fizz Monster. That’s your choice. What of the beer itself? It is a very dark red in colour with an off-white head that remains (albeit thinly) right to the bottom of the glass. The beer is quite smooth. The dominant flavour is chocolate (though it is by no means massively chocolatey) with some fruitiness and there is an underlying malty bitterness. The finish is quite dry with a hint of smoke and a whisper of dry earthiness. I was quite prepared to poo-poo this beer when I saw it, but it is surprisingly good. Not of the first rank of porters, maybe, but a good effort. If only it was brewed by Tetley!